Top Garden Furnitures You Must Have to Enjoy Hot Summers! With the rising temperatures we have been witnessing yearly since the past decade as a result of climate change and the Greenhouse Effect, the heat of summer months is becoming more and more intolerable for a vast majority of people around the planet. This condition has furthermore been worsened by the recent economic crisis, and subsequently many families who choose not to go on holiday abroad have opted for a more relaxing and budget friendly holiday, transforming their home garden into a perfect summer retreat where they can bask in the sun and take advantage of the many accessories and furniture essentials to make their garden into an enviable summer holiday experience and at the same time combat the heat. Cheap furniture is available for under £50 at many outlets, and this includes essentials like a wooden drink trolley to help cool off the whole family while avoiding tiring trips back and forth between the kitchen and the garden. A BBQ grill is indispensable for outdoor fun with friends and neighbours, so keep a lookout on the special deals for large or moderate­ size BBQ set­ups depending on your needs. To ward off the excessive heat, parasols and garden sails of various sizes complemented with lounge chairs help make your summer garden experience more comfortable. 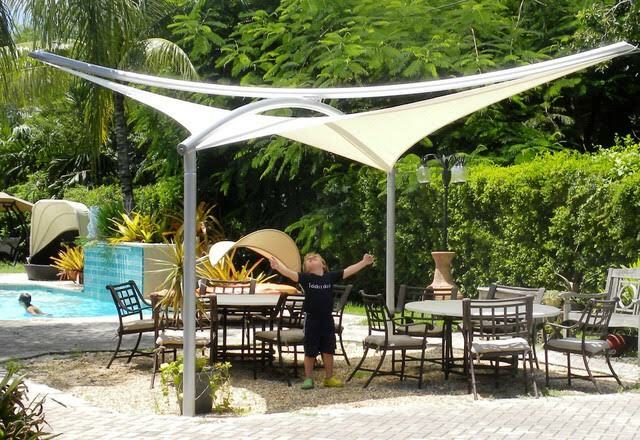 Stand­alone parasols with solid base can be easily installed or placed to provide shade in any area of the garden, It is recommended to use high quality furnitures with resistant materials. A lot of brands provide similar products offering a large choice of luxury items like hexagonal and triangular garden sails that will help capture and deliver some of the fresh wind breeze. Naturally, no summer holiday can be complete without a swimming pool. For the occasion, consider an inflatable swimming pool that can accommodate the whole family and your friends. With several inflatable models like a 10 ft across easily installable pool connected to the garden hose, this eliminates the hassle of built­in large swimming pools requiring constant cleaning and maintenance. Best of all, they can be packed and removed quickly and easily. The kids will also love a swing set­up where they can spend hours of enjoyment and which can be easily placed in any area of the garden. For delightful evenings when the temperature cools and the fresh summer breeze blows, portable natural heaters like fire bowls and steel chimeneas will complement the party mood of your garden summer and keep you warm. Steel chimeneas are a good choice because they have a rain lid and are child­proof. And do not forget to liven up your summer evenings with outdoor stake lights powered by solar energy, easily popped in the ground during the day and when fully charged capable of delivering up to eight hours of light.